This handsome insect appeared in the Stevenson screen housing my weather instruments at Nedd (NC1331) on 29th April 2015. At about 14mm long, it is one of the largest of the shieldbugs, and had probably just emerged from hibernation under bark or in a grass tussock. Its colour does resemble that of hawthorn berries, a principal food in season. This shrub is rare as a native in Assynt, but it is planted, and there are six examples nearby, in the grounds of Willy Gunn’s Cottage. When hawthorn berries are not available, it feeds on the leaves, or those of other trees, such as oak, hazel, birch and holly. 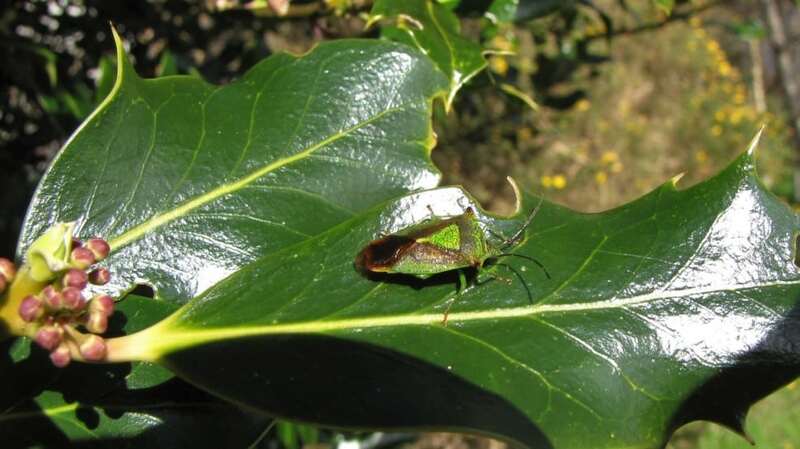 This shieldbug may be spreading north in the British Isles. Highland records are scattered around the coast, with previous ones in Assynt from NC02 and 13. Its scientific name is Acanthosoma haemorrhoidale; the generic name refers to its spiny body, I would not like to speculate on the origin of the specific name.